The lake trails, springs and bridges of central Austin define its character and are essential pieces of the city's history. Take a ride on on the quiet, shaded miles of Butler Trail, take in the scenery and learn about the city from your friendly local guide. Stops include Barton Springs, Hope Outdoor Art Gallery, the Congress Street Bat Bridge and the boardwalk over the lake. With all of the natural beauty surrounding you, it'll be hard to believe that you're in the middle of a bustling city. 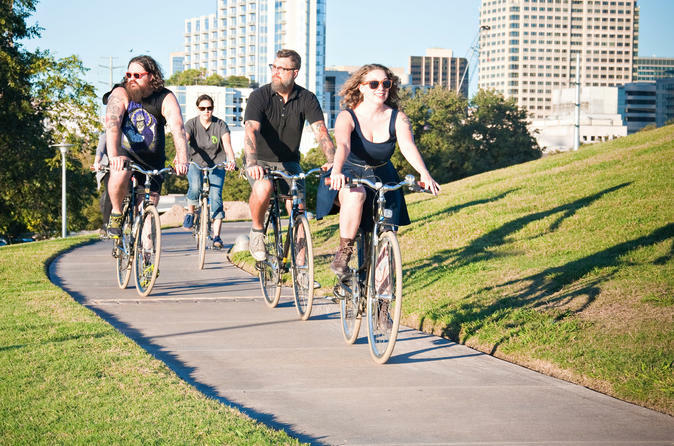 Our Austin's Lakes, Springs and Bridges Tour gives you a chance to ride the shaded Butler Trail around Lady Bird Lake, stopping along the way to talk about Austin's historical beginnings and present day boom. We'll swing by the Congress Street bridge, home of the largest urban bat population in the world. You can take a dip, soak your feet or just enjoy the natural beauty from the banks when we visit the world famous Barton Springs or the oldest spring-fed pool in Texas, the Deep Eddy. We'll wrap up with a visit to Hope Outdoor Art Gallery where you'll have a chance to leave your mark along with thousands of others at this ever evolving art project. The is a two hour tour. It is recommended that guests arrive 15 minutes early for an orientation before hitting the road. Make sure to wear comfortable clothing and closed toed shoes for biking and it is suggested to bring a bottle of water. The tour operator provides comfortable bikes with gears and hand brakes as well as a helmet which is optional.